For the first three decades of Israel’s existence, its economy was socialist and centralized. Only in the fourth decade of its existence did extensive liberalization in the market begin, with parallel significant economic growth. In the past thirty years, the GDP of the State of Israel has grown tenfold and the standard of living has improved significantly. This is not a coincidence. Looking at the economic situation of the nations of the world, it seems clear that the adoption of a liberal economic policy, which encourages free enterprise, brings growth and prosperity for all segments of the population, while the policy of a centralized economy with government interference inhibits the growth and undermines the economic welfare of the entire population. The economies of the countries that lead in indices of economic freedom, such as Switzerland and Singapore, have enjoyed even more rapid growth during this time. Zehut believes that a free market economy is the most efficient model and that its adoption is the key to the future growth of the Israeli economy. Moreover, it is also the most moral and just model, because it does not harm the freedom of Israeli citizens to conduct transactions of their own free will and to work to improve their economic situation. Zehut will act to reduce government involvement in the economy, reduce the bureaucratic apparatus and promote economic freedom in the State of Israel. The State of Israel is blessed with intellectual and entrepreneurial capital, which gives it a significant advantage in the development of start-ups and high-tech industries. Adopting the principles of the free market will enable this advantage to be expressed in the best and most effective manner. As can be seen in the following graph, the State of Israel lags behind in the indices of economic freedom. According to the Heritage Foundation, Israel is only 35th in the world in terms of economic freedom. We aim to make Israel one of the world’s leaders in the economic freedom index. The chapters in this part of the platform will outline the steps that Zehut will take in order to promote economic freedom in various areas of the Israeli economy. Sometimes it is argued that the free market is beneficial only for the rich, and that the poor are left behind – but the opposite is true. In fact, a liberal economic policy is particularly helpful to the lower deciles. 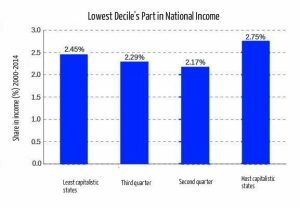 As shown in the first graph, despite the fear of expanded gaps, it is specifically in the most capitalist nations that the bottom decile’s share of national income is the highest. 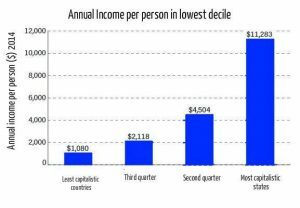 As the second graph shows, the absolute income of the lowest decile in the most liberal countries is much greater than that in less liberal countries. 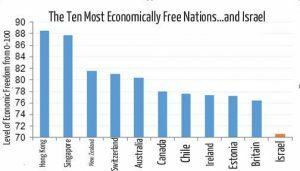 In other words, the lowest deciles in countries that have adopted the free market model prosper more – both relative to the other citizens of the country and in absolute terms. One of the most striking differences between the Israeli economy and the world’s successful economies is the abundance of laws and regulations that limit, regulate and manage the economic and social life of the Israeli citizen. Zehut believes that the freedom to act, trade, work and maintain a social and economic life far from the watchful eye and the heavy hand of the central government is essential for a life of freedom and prosperity. According to the Fraser Institute, the State of Israel stands at 80th place in the world according to the “Regulation Index”. In other words, the burden of regulation on the citizens of all the successful countries in the world is much lighter than that of Israeli citizens. The countries that suffer from regulation more than the State of Israel include countries such as Gambia, Ghana and Greece. These are not countries worth emulating. A central part of Zehut’s program for the promotion of economic freedom in Israel is a significant easing of the burden of regulation in all areas of the economy by a wide ranging – but considered – elimination of unnecessary laws and regulations. Because state-sponsored monopolies, lack of competition, and tariffs are among the main causes of the rising cost of living, Zehut’s vision for the struggle against the cost of living is to turn Israel into a free trade zone. Zehut will act to abolish the restrictions that exist today on free competition and minimize the state’s involvement in the economy. Free competition, as practiced in prosperous countries such as Switzerland and Hong Kong, is also the most efficient and moral mechanism that guarantees, apart from maintaining personal liberty and freedom of occupation, low prices, high quality and a variety of products in almost every area. Zehut’s economic plan will encourage free competition and growth of the Israeli economy, thereby reducing the cost of living. The complex tax laws in Israel are the result of a government policy that does not see taxation as a necessary evil needed to finance state expenditure, but rather as a tool to promote economic and social policies it considers desirable. According to the present system, behaviors and populations that the authorities wish to promote receive tax relief, while undesirable behavior is punished with higher taxes and special levies. The exceptions are gainful employment and profitable initiatives – activities that are beneficial to the economy. It might be expected that the state would encourage them, but they are punished in practice with the greatest taxation. As a result of this system of taxation, Israel has an excessively complex tax structure that damages the economy, harms entrepreneurship and is too complicated for the average citizen to understand. Large companies and wealthy people can afford first class accountants who are able to plan their tax payments to keep them as low as possible. Entrepreneurs, the self-employed and owners of small and medium businesses that do not have these resources see their tax payments rise sharply just when they start to succeed. Many become discouraged and give up on their projects, many more give up on their initiative from the outset. Economic development is adversely affected because talented people are not bringing their relative advantages to fruition. At the same time, cronies and pressure groups exert their political power to gain tax concessions and exemptions that serve their needs. It is hard to assess the damage to the economy and the decline in tax revenue as a result of this tax policy. Zehut will reject the current tax policy and adopt the flat tax system – a flat tax (as low as possible) that applies to all types of income: Without tax brackets, without credits and without concessions to cronies. A flat tax will encourage all citizens of Israel to initiate, advance and succeed as much as they can, and will eliminate one of the main tools of the government for top-down economic planning. The average citizen will be able to easily fill out his tax return, which will be a single page, whether salaried or independent. If tax relief for segments of the population or certain types of investments prove essential, it will be possible to convert them to a direct payment – so that we can see exactly how much funding costs us, and to weigh it each time anew. Along with simplifying the tax structure, Zehut undertakes to reduce the tax burden on Israeli citizens. Reducing the tax burden will leave more money in the hands of the public, will contribute to the economic prosperity of the market, and has the moral advantage of allowing each person to retain as much as possible from the fruit of his labor. In order to allow fulfillment of the economic potential of the economy, the state must refrain as much as possible from interfering in the economy in general and in businesses in particular. Today, Israeli policy makes business activity within its domain difficult by means of high and unequal taxation of companies and through exceptional regulatory and bureaucratic obstacles. Zehut will change this situation and turn Israel into a desirable destination for investment and business activity, using the steps outlined in this chapter. Corporate tax, which affects tens of thousands of businesses in Israel and keeps away foreign companies interested in investing here, constitutes a major obstacle to economic growth, employment and general welfare of the country. Zehut will act to lower it to a level that will prevent damage to Israeli companies, and the State of Israel will become an attractive destination for foreign companies and investments. Zehut will lower the corporate tax across the board, transparent and equal for all types of companies in the country. It is not the role of government to choose which sectors should win or lose; it is not the role of government to favor exports over imports or hi-tech over traditional industry. We will not discriminate between sectors or interest groups either for good or for ill. The Investment Encouragement Law, which essentially gives tax breaks to companies of a certain type, will be eliminated. In the first phase, we will reduce the corporate tax across the board to 18%. In the second phase, we will strive to reduce the tax rate to 12.5%. Streamlining the budget, along with the economic boost the economy will receive from a dramatic reduction in corporate tax, will actually increase the general tax receipts to a level that will enable us to significantly reduce the income tax rate. The state must avoid investing in development projects or certain areas it is interested in promoting. When the state chooses to allocate resources to a specific area or a particular company, it can be assumed that the state will execute it less well than if it had been executed by private investors within the framework of the free market. The state lacks the knowledge and motivation that private investors have. Its involvement in industry investments is liable to cause not only the direct damage of loss of resources invested in the wrong way, but also the indirect damage of preventing those resources from being used for worthwhile investment initiatives. Additionally, such involvement opens the door for lobbyists and cronies to influence the decisions of elected officials, so that the decisions that are made are liable to be influenced by extraneous considerations. This invites theft. Zehut will prohibit the granting of benefits, incentives and grants from the state to certain companies. Just as all companies in all areas will pay the same corporate tax, they will be equal in the eyes of the state in all other ways. The state will not favor one company over another. Only in this way will it be possible to ensure that the market will indeed be free, competitive and free from the influence of extraneous considerations. Government bodies whose role is to assist entrepreneurs or to encourage industry will be closed. Attempts by the government to encourage growth through market interference usually only slows it down. The bodies engaged in this must be shut down. Among the organizations that will be eliminated are the Export Institute, the Innovation Authority (formerly the Chief Scientist), the Small Business Authority, the Ministry for Enterprise, technological entrepreneurship incubators, and others. The powers of the Economy and Industry Ministry will be cut accordingly. The main role of this ministry is to promote the economic growth of Israel, while achieving certain social goals. In accordance with our view that sees this as harmful interference, most of the powers of this ministry will be eliminated. Powers involved in enforcing laws and regulations will not be eliminated at this point, but the need for such laws and regulations will be reviewed and regulations with no real need will be eliminated. “Rabbi Yehuda says: … and not to lower prices (to sell cheaply, because it accustoms people to patronize him and deprives his colleagues of food); The Sages say: (One who lowers prices) He is remembered for good! (For because of this, fruits in the warehouse are sold more cheaply. And this is the law)”. Mishneh Bava Metzia, Chapter 5, with the commentary of Rabbi Obadiah of Bartenura included in it. Currently, Israel is ranked only 52nd in the world and 29th out of 32 OECD countries with the highest incomes in the index of ease of doing business. As a general rule, a high ranking in business freedom leads to better economic and social results, and we therefore aim to facilitate doing business in Israel and win a place in the top five of this index. To do this, we must reduce regulatory requirements and unreasonable bureaucratic obstacles impeding the establishment, expansion and management of business in Israel. Bureaucratic and regulatory barriers constitute an obstacle to entrepreneurs and investors who wish to invest in establishing a business in Israel, and encourages them to invest their money and energy elsewhere, or even to give up on the project altogether, thereby harming competition and growth of the Israeli economy. This is especially true for small and medium businesses, which are often unable to bear the costs necessary to meet regulatory requirements or costs of hiring a professional to guide them through the bureaucratic processes. Thus, these barriers tilt the market in favor of major companies and giant corporations in an unfair manner that harms the economy. In fact, regulation often serves to block new competitors, as it is tailor-made for major companies, while Israeli citizens pay the price for the lack of competition. Therefore, even excessive regulation whose necessity isn’t evaluated periodically allows elected officials to aid their cronies and lobbyists for extraneous reasons, causing damage to the Israeli economy. Waiting times for administrative procedures will be shortened and their costs will be reduced. In order to make it easier for entrepreneurs to establish and run their businesses, waiting times for administrative procedures must be shortened. The first step is to examine the need for each and every procedure, to give up those procedures that have no real need, and to simplify as much as possible those that are needed. The second step is the modernization of administrative systems, so that it will be possible to submit forms and pay them online and possibly to process them automatically in part. This will ease the workload on bureaucrats and other professionals. Afterwards, significantly shorter deadlines will be set, and where necessary, the workforce will be updated. For example, the process of opening a business currently averages 12 days and costs about 5,000 shekels. By reducing the bureaucracy involved in the process and providing the option to submit forms online, we aspire to get to the point where it will be done within a single day at a cost of about 500 shekels. Unreasonable regulatory requirements will be eased or eliminated. We should distinguish between legitimate and reasonable regulatory requirements, necessary to protect public safety or prevent fraud, and unreasonable demands whose usefulness is marginal or even negligible, while their implementation involves an investment of time and many resources. We undertake to periodically review the regulatory requirements taking into account the circumstances and technological or other developments, and to eliminate or ease unreasonable or unnecessary requirements and restrictions. The power of the Israel Standards Institute will be reduced as described in the chapter in this section that deals with imports. Approval of commercial building construction will be easier when Zehut’s housing program is implemented, as set forth in the housing chapter of this section. Contracts will be enforced more efficiently and faster. Today, the average legal process (from filing a claim to the court until the disposition of the judgment) takes 975 days. Zehut will shorten the time it takes to about a quarter of its current time (250 days) by significantly increasing the number of judges, which will help reduce the burden on the judicial system. Some economic disputes will be decided in the parallel system of Jewish civil law (as described in the chapter “The Jewish legal system” in the platform), which will also help reduce the load on the judicial system. Imports are the means by which Israeli citizens can enjoy the highest quality products and the most competitive prices the global market has to offer. Tariffs and import restrictions are among the factors that contribute more than anything else to the increase in the cost of living in Israel. Basically, when the state makes it difficult for residents to purchase imported goods and forces them to buy inferior or more expensive local produce instead, actually subsidizes the least efficient and competitive local industries at their expense. If residents are able to purchase imported products at a competitive price rather than local produce, they will be left with excess resources that can be used for the purchase of such services and local products that they really want to purchase. We believe that the efforts of the country to reduce imports and restrict the actions of importers causes serious damage to the Israeli public, so we are committed to sharply reducing state interference in imports. At the same time, we will strengthen manufacturers, traders and service providers by lowering local taxes and reducing government involvement, as detailed in the section “Industry and Trade in Israel”. Zehut will completely but gradually eliminate tariffs and import quotas. Only in this way will the Israeli public be able to enjoy the advantages of a global market. In addition, all restrictions on imports that were adopted for non-economic reasons will be considered anew, and unreasonable restrictions will be removed. Zehut will act to dramatically restrict the power of the Israel Standards Institute to undermine competition and imports. The Standards Institute often constitutes an obstacle to imports, even of products meeting rigorous standards that are accepted worldwide. This obstacle is often impassable for small and medium-sized importers. Too often, arbitrary exercise of authority by the Standards Institute raises the price of imported goods to Israel and does not increase safety at all. We will act to limit the authority of the Standards Institute, even by adopting acceptable strict standards, such as the European standard. The Standards Institute will not be able to prevent the import of products meeting these standards or to delay them for unnecessary testing. This limitation on the power of the Standards Institution will significantly reduce the negative impact on imports and the high cost of living, without harming its ability to carry out its duties. Reducing the power of the Standards Institute will also benefit local producers. Any standard adopted for the purposes of import will also be adopted for the purposes of local production. It will be possible to manufacture in Israel not only in accordance with Israeli standards, but also according to one of the other strict standards that will be adopted. This will allow flexibility in the production that is necessary for Israeli manufacturers — especially small and medium manufacturers that struggle to cope with the stringent regulatory requirements — without compromising the safety of the Israeli consumer. The Israeli government is run by budget deficits as a matter of routine. The missing money for financing its activities is achieved by increasing the national debt. Zehut believes that this modus operandi is defective. It is true that there are emergencies that justify taking a loan, but no economy, small or large, can run a deficit over time. Increasing the national debt slows down a country’s economy, reducing the government’s ability to borrow money in emergencies and constitutes a burden on future generations. Zehut will demand that the government will conduct Israel’s affairs with economic responsibility. Zehut will not formulate a budget with a deficit unless there is an urgent need to borrow money – for example, in times of war. Zehut will require government ministries to demonstrate budgetary responsibility and perform their tasks efficiently based on the resources available to them. Instead of a government unable to meet this requirement irresponsibly borrowing more and more money at the expense of future generations, it will have to accept the budget shortfalls by finding other funding sources, so that it will not be able to avoid reporting to the public on its economic behavior. Zehut will streamline the work of the government and reduce its costs. The largest budget requirements come from the regulation and bureaucracy ridden education system, and from the defense establishment, with the host of budget planning problems that characterize it. Zehut promises to take the necessary firm action to address them. Zehut will set itself the goal of reducing the national debt. The aspiration when drafting the state budget will be to reach a budgetary surplus that will serve to reduce the national debt, taking into account the economic viability of the step. We are committed to bringing reduction of the national debt into consideration when the budget is built. We do not fear a reduction in the state budget. We believe that the key to the economic prosperity and welfare of the residents of Israel is not increasing the overall state budget – i.e., increasing the government – but rather the contrary. In most areas, a citizen can attend to his own welfare better than the government. The citizen is the one who knows what his goals are and is also the most interested in achieving them. Increasing the state budget means the transfer of resources from citizens to the government, which will use some of them to finance its operations and invest what is left of them less efficiently than the citizens from whom the resources were taken would. Therefore, we aim to reduce the state budget, to leave more resources with the citizens, and to leave them the responsibility and the freedom to see to their own needs, in accordance with their worldview. Jewish sources have already granted the right of to develop transportation infrastructure to the state, even at the cost of local harm to private ownership: “The king … and may break through to create a road, and we do not prevent him; the king’s road has no measure”. But unlike the basic construction of transportation infrastructure, it is possible to question the accepted view that the state’s role is also to organize the use of that infrastructure. Is there any logical reason why the state should organize public transportation? Organization of public transportation by the state is an invention of modern states, which has been accepted by many countries. But is there justification for it? “There is a program that I would eliminate… the Amtrak subsidy”. In 2016, the Transportation Ministry invested 5.2 billion shekels in subsidies for public transportation and another 3.8 billion shekels for the purchase of equipment and infrastructure for public transportation. The Transportation Ministry selects and purchases buses for all bus companies and train cars and engines for Israel Railways. Tax revenues from cars were more than 40 billion shekels, while only 6.1 billion shekels were spent on paving roads. In other words, the lion’s share of the money collected from car owners is not returning to them as infrastructure, but is diverted to public transportation and other purposes of the state budget. The high tax on vehicles increases the value of the vehicles and as a result, older vehicles, which in other countries would have been thrown into the junkyard, stay on Israeli roads. The oil systems in these vehicles fall into disrepair and cause added air pollution. The Transportation Ministry is opposed to sharing private vehicles, thus increasing the number of private vehicles on the road, but spends a fortune developing public transportation. Autonomous vehicles that already travel without a driver in several countries, will soon come to Israel and will constitute significant competition to public transport. In an autonomous vehicle, there is no need to drive and the vehicle takes the passenger to his destination in the fastest way. A free country does not educate its citizens. A free citizen may choose to travel in any vehicle he chooses. Taxing the owners of private vehicles in order to fund public transportation that loses a fortune each year is a mistaken and unethical policy. Will the move to private vehicles cause Gush Dan become one big giant traffic jam? The Kansas City metropolitan area has more than 2 million people (several tens of percent more than in Gush Dan). On the one hand, in Kansas City, the heavy rail passes through only once a day in each direction and the light rail was privately owned, until it became unprofitable in 1957 and was closed. On the other hand, the number of roads per resident is significantly higher there than in other cities. In Kansas City, the ratio of the total length of roads to the size of the population is 3.15 times larger than that of Los Angeles. Unsurprisingly, in Kansas City, there are almost no traffic jams, and Los Angeles is the most jammed. The policy that solved the infrastructure problems in Kansas City can be applied in Israel as well. In this picture you can see the road infrastructure in central Kansas City. At the center of the picture is a sunken highway and the level above you can see the wide roads. “Decentralization has not only an administrative value, but also a civic dimension, since it increases the opportunities for citizens to take interest in public affairs; it makes them get accustomed to using freedom. And from the accumulation of these local, active, persnickety freedoms, is born the most efficient counterweight against the claims of the central government”. The US has three levels of transport authorities – municipal, state, and federal. In Israel, the Transportation Ministry centralizes all the roles of all of these transportation authorities. Israel is significantly smaller than the United States and therefore two levels of transportation agencies are sufficient. Responsibility for transportation infrastructure in the domain of local authorities should be transferred to “metropolitan transportation authorities” in each regional council, local council or municipality. The government already made this decision in 2011, a decision which until now has still not been put into effect. The Transportation Ministry will no longer be the financer and overall director of public transportation companies. Public transportation companies will continue to operate only profitable lines. Considerations for purchasing vehicles, opening and closing lines, the frequency and locations of the stations will be the sole responsibility of the companies. Some argue that the problem of traffic jams on the roads of Israel is endless and that the only solution lies in upgrading train infrastructure, but an examination of “the map of traffic jams” proves that we are talking about a limited and finite list of roads. The answer to the problem of traffic jams will be provided by expanding roads where possible, as was done on the Ayalon Freeway between the JNF Interchange and Glilot, and will significantly improve the traffic flow in this segment. In places where it is not possible to expand the road, a second story can be built for roads, as was done in Kobe, Japan, in Chicago, and in many other places around the world. Even the Iranians built a second story of lanes on the Trans-Tehran highway. 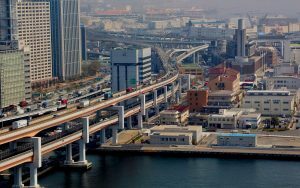 In this picture you can see a two-story highway in Kobe, Japan. A claim that arises frequently in discussions about public transportation as compared to private vehicles, is that private vehicles pollute much more than public transportation. This argument is incorrect. New cars emit virtually no pollutants into the air. In the US, despite the relatively high level of motorization in the world – about 0.8 vehicles per person, air pollution is much lower than in Israel, where the rate of motorization is 0.365 vehicles per person. Air pollution is caused by a mechanical defect or gasoline with oil additives. The Palestinian Authority, Jordan and Egypt have no annual air pollution testing and loose monitoring of fuel additives. Therefore, in Amman and Cairo, figures are soaring to dangerous levels. In Israel, the city of Sderot near Gaza and the city of Eilat near Aqaba suffer from high air pollution. By comparison, the city of Haifa, which suffers from a negative image of pollution, is less contaminated than Sderot and Eilat. The distance from Petah Tikva to Qalqilya is about 10 km and as a result, Petah Tikva is more polluted than Tel Aviv. Since the growing number of private vehicles is not the cause of air pollution, but rather only faulty vehicles and gasoline with oil additives that are accepted only in shoddy countries, Zehut does not see any need to reduce the number of private vehicles in order to improve the environment. Instead, air pollution will be reduced through strict enforcement of fuel quality and licensing institutions. The tax on vehicles today is the customs duty of 83% plus VAT which also applies to the customs component; i.e., 114% in addition to a high annual fee. The fuel tax is comprised of a “Blu” excise tax at 3.05 shekels per liter plus VAT which also applies to the “Blu” component”; i.e., about 252% tax. This high taxation, which funds the public transportation budget, must be lowered. In particular, the IBA fee of 153 shekels per year, which has nothing whatsoever to do with the subject of transportation, must be eliminated. In many states in the US, there is no annual vehicle test, and in other states, the test is only for air pollution levels. The reasoning behind this policy is that the state does not interfere with private property of citizens. We think it is important to test for safety and therefore Zehut will act to focus on it by eliminating the clauses that are not related to safety. The positive trends of opening up competition in the areas of ports, the seas, and aviation should also extend to ground transportation. Any company should be able to provide public transportation services at its own expense as a regular business. State intervention will focus on vehicle safety approval only — for all vehicles in Israel. In a free country, the state does not determine for the citizen what he may do with his property, and in particular, what he may do with his vehicle. Uber and other car sharing companies will be able to operate in Israel. At the same time, the high tax on taxi cabs will be reduced in order to allow for fair competition. According to a report by the US Department of Transportation in 2015, 94% of accidents are the driver’s fault, 2% are caused by the vehicle, 2% are caused by the environment, and 2% are due to other reasons. As part of the war against traffic accidents, Zehut will act to permit autonomous driverless vehicles in Israel as they were permitted in Michigan in November 2016. In addition, we will act to increase the budget for dealing with dangerous roads (“Red Roads”) in order to make the infrastructure more forgiving of driver errors. In the US, unlike in Israel, there are airports in joint military-civilian use. Sixty nine shared airports under civil aviation supervision (“Shared Use”) and 24 shared airports under military air control (“Joint Use”) Although the population density in the US is only 32.68 people/km², and there is plenty of space. By comparison to the United States, Israel’s population density is greater by nearly a factor of 12 – 387.55 people/km² and the shortage of space in Israel today is high. At the international airport of the city of Tucson in Arizona, which has both military and civilian usage, there is a squadron of 72 F-16 planes, and they are likely to absorb several dozen F-35s there as well in the coming years. 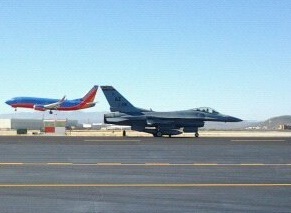 The military part of the airport in Tucson also serves as an international training center for F-16 planes. The types of military airplanes in Tucson are very similar to Israel’s aircraft at the airport in Nevatim, but Nevatim is a military airport only, and Tucson Airport is a joint civilian and military airport. In this picture you can see a civilian airplane taking off from Tucson, Arizona while another runway has an F-16 airplane. Seven km from Tucson International Airport, the Davis-Monthan airbase is located, which has a squadron of 82 A-10 fighter aircraft, so that the skies of Tuscon are far more crowded than those of Nevatim, and even so, civil aviation also manages to find its place in Tucson. In Tucson, the annual rainfall is 290 mm, and 85% of the year are sunny days. In Beersheba, the annual rainfall is 204 mm, and 92% of the year are sunny days. The State of Arizona is “the airport capital” of the United States because it is mostly desert state (approximately 8.5% of the citizens of Arizona work in the airline industry, compared with 0.3% in Israel). Similarly, the Negev should become the airport capital of Israel. The airport in Nevatim will become a joint civilian-military airport, similar to the existing model of the international airport in the city of Tucson, Arizona, and thus become complementary to Ben Gurion airport. The airport in Nevatim will also provide a solution for the problem of aircraft noise for the many people who live very close to Ben Gurion Airport. The monopoly – almost all the land that can be built (93%) is registered under the ownership of a single “owner”: the Israel Land Authority, in other words, the State. This authority releases land for construction stingily and subject to high taxation, creating tremendous and constant price pressure on all the land for construction in Israel. The bureaucracy – the planning and approval procedures for residential construction are built so that the process of approval of construction through them takes years – far more than is customary in other countries. The excessive regulation and the many restrictions on construction prevent developers from meeting market needs, and make construction more expensive. The freeze – more than 20 years since Rabin, Peres and Netanyahu recognized the “Palestinian people,” Israeli governments are preventing or delaying new construction in the heart of the Land of Israel – in Judea, Samaria, and even in Jerusalem, thereby substantially reducing the possibility of building on the national level. Each of these factors separately reduces to a large extent the supply of land for residential use in Israel and raises the price of housing. The result of the three of them together is a severe and ongoing failure that affects all of us seriously. The land belongs to the citizens, not to the state. Zehut will dismantle the Israel Lands Administration and will transfer the vacant land it holds to control of the citizens. Beyond the economic and moral significance of the return of the land to the citizens of Israel, this move will allow the land to be traded on the open market and will significantly increase the supply of land for construction, thereby lowering land prices in Israel. Zoning and building restrictions will be determined by the local community. State and local authorities will not be able to determine what use will be made of private land and what restrictions will apply to the construction. The community of landowners in a particular area will determine whether to limit the land use to industrial, commercial, residential, agriculture and so on. The community will also decide on the imposition of restrictions on the building, such as a limit on the maximum building height. This will allow the flexibility necessary for the development of building in communities, so that it will match the demands and needs of the community. The phenomenon in which land is poorly utilized or even stands empty in anticipation of a zoning change will end. Many of the communities are likely to respond to market demands and increase the number of designated areas for housing, thereby reducing the cost of land. Reduction of bureaucratic barriers. The processes of obtaining building permits will be considerably shortened and simplified, and many regulatory restrictions will be eliminated or transferred to a more local level (local authority level or community level). Regulatory bodies will be eliminated or reduced accordingly. This will make the construction process faster, easier and more lucrative for the benefit of construction developers and the public interest. Application of full sovereignty in Judea and Samaria. With the application of sovereignty, the construction freeze will be eliminated, and in fact, all of the restrictions and special powers in Judea and Samaria will be eliminated. In this way, free construction will also be allowed in our heartland. (The plan presented below is based directly on the plans of engineer Motti Heinrich, as published on the “Kav Yashar” site, with his kind permission. The aim of the revolution is to simplify the use and sale of land, to bring about a continuing renewal of cities, to adapt land-use and construction to the demands of citizens (consumers), to minimize corruption in the industry by reducing the need for contact between the citizen and the establishment. Redefinition of land use classifications: The accepted division (residential, agricultural, commercial, industrial, entertainment, craft, office, etc.) will be eliminated. Four categories will be redefined: nature reserves and gardens, public infrastructure, government buildings (national or local) and land for private use. The division of cities into small and homogeneous districts: Cities will be divided into small areas with population as homogeneous as possible, in accordance with local communities. The purpose of the division will be to transfer a large part of the municipality’s authority to restrict construction to local communities. Replacing the City Building Plan (CBP) with the District Plan Agreement (DPA): Restrictions on construction and land use in a given district will be accepted by residents of the district through the approval of an agreed-upon district plan, without the interference of the municipality or the local authority. This model will enable local residents to determine the nature of the district themselves and give them the flexibility necessary to respond to the changing demands of the local population and market conditions, while protecting the residents of the district from decisions that do not take their needs into account or that stem from extraneous considerations. Redefining the right to object to construction so that it applies only to clear and concrete nuisances. Reform in the construction process: We will create a more standard and simple format for the construction process, reduce the amount of bureaucracy required, and remove excessive regulatory barriers. This will reduce the ability of the local authority to delay or prevent construction for irrelevant reasons, along with all the negative phenomena resulting from this ability, and the dimensions of corruption will be reduced. The reform will reduce the costs associated with construction, shorten the time required before construction projects are implemented and encourage investment by developers in the field. Necessary building regulations will be strictly enforced and perpetrators will be severely punished. Elimination of all taxes unique to land: capital gains tax, betterment levies, consent fees and more. The municipality will be able to collect a fee for any new construction, the main purposes of which will be to cover the costs of building supervision and fund the future expansion of public infrastructure (such as roads and sewage). Establishment of a mechanism for rapid registration in the Land Registry. The authority to regulate construction in the city is currently in the hands of the municipalities, which implement it in accordance with a master plan that they prepare (better known as the City Building Plan or CBP), based on the concept that only a central planner with an organized and rigid plan can effectively design a complex system such as a city. When the municipality is given this planning authority, it is under the assumption that the municipality will be able to allocate permissible uses of its land in an efficient and balanced manner, to impose or remove construction restrictions according to the needs of the residents, and to accurately predict their future needs. Zehut believes that this assumption does not meet the test of reality – The central planning actually harms the ability of cities to develop, harms the residents’ ability to make efficient use of their lands, harms the economic feasibility of construction projects, and causes an increase in housing prices. In order for local communities to respond to changing market conditions and changing population needs, most planning authority must be transferred to the local community. We will do so by replacing the City Building Plan with an appropriate plan on the community level – the District Plan Agreement. The City Building Plan will be eliminated and replaced with District Plan Agreements. The authority to determine building and land restrictions will be taken from the local authority and given to the landowners in each neighborhood. This will enable the residents of that neighborhood to directly influence their residential environment and the value of their assets, and neutralize the influence of external factors with foreign interests. Neighborhood residents are the ones who are directly affected by the building plans, so their ability to assess the implications is better and their incentive to make correct decisions for the neighborhood is greater. All of the limitations that appear today in the CBP can also appear in a DPA. For example, a DPA may determine an upper limit on the maximum permitted building height, a minimum number of parking spaces, or the possibility of opening a business in a given district. A District Plan Agreement will be passed by a majority vote for a period of twenty years. Approval of the DPA will be made by means of a referendum in which all the property owners will participate in a given neighborhood. It will be possible to make changes in the DPA before it expires by means of signatures of a special majority of the property owners. Decentralization of decision-making authority so that it must be approved by most residents rather than by a limited number of officials will greatly reduce the ability of influencing decisions through bribery or other illegal means, thereby significantly reducing the degree of corruption involved in this process. The CBP will receive DPA status for a 15-year adjustment period. During the adjustment period, the restrictions defined in the CBP will continue to apply as a default DPA in each district separately and will then expire automatically. Toward the end of the adjustment period, the property owners in the district will be able to adopt a new DPA. This lengthy adjustment period will allow property owners to examine the various plans or offer their own plans according to the considerations that guide them. The DPA will be an agreement between property owners that can be enforced in court. A note will be made in Land Registry records of properties subject to a DPA noting that fact. Potential buyers will be able to consider the influence of restrictions that appear in the DPA on their preferred lifestyle and the possibility of improving the property before they purchase it. Public buildings, urban gardens, roads, and urban infrastructure will remain subject to the local authority and will not be subject to a DPA. Adoption of a DPA in place of descriptive municipal plans will create a system in which building limitations will be able to conform themselves to changing market demands. In order to allow cities to flourish and develop naturally in accordance with the needs of the population, this process must be completed by allowing developers to respond quickly to changing demands and building without unnecessary delay. For this purpose, a uniform and orderly process of building approval is needed, which will enable the preservation of public safety and municipal infrastructure without subjecting developers to arbitrary demands or unnecessary bureaucratic foot-dragging. Zehut will act to implement a comprehensive reform of the construction process, which will make the process simpler and more uniform, thus reducing administrative costs to developers, shortening the period of time until occupancy of the building, and reducing the uncertainty resulting from over-regulation. The reform will make construction more cost effective for developers and will reduce costs to consumers. A developer who wishes to build a building on land that he owns will inform the local authority and will be assigned a website in a standard format for monitoring the construction. The architect who designs the building will manage the site and enter the required information: the dimensions of the building, its location, the precise manner in which the building will connect to the municipal infrastructure and the planned burden upon them, the intended use of the building, the construction standard, details of all the private supervising companies, and the names of the engineers, supervisors and professional consultants. The published details will have to conform to the details in the construction plan, which the architect must complete before entering the information. In addition, the District Plan Agreement that the construction will be subject to will be marked, if there is such a plan, as proof that the architect is familiar with the plan and the restrictions specified therein. Each of the consultants, and all of them together, shall have the legal responsibility for planning. Each construction project will be accompanied by an insurance company. The insurance company will bear financial responsibility for any damage caused by improper or incorrect construction from the start of construction until many years after the building is occupied and functioning. The details of the insurance company that insures and accompanies the construction will also be published. The developer will also publish on the website a survey of the environmental implications of the building. The company that conducts the survey will also be exposed in the future to claims for improper disclosure. The law will require the appointment of professional consultants – similar to the existing situation. The information that the developer will have to publish is all the information required to ensure that the building will not cause damage to the building’s visitors, the general public and municipal infrastructures. Intentionally providing false information on the Web site will constitute a crime that will be strictly enforced and the offenders will be severely punished. On the day that the information is published in full on the Internet, the contractor will announce the completion of the planning to the municipality and will publish it in advertisements in the press and in wall posters on the buildings adjacent to the designated building site. Within 60 days from the date of publication (120 days for a large building) residents, or municipality, will be able to delay the construction if they have just grounds. The delay will be carried out through a petition to the court. If no objection to construction is filed during this period, the developer will automatically receive a building permit. This reflects a complete change of perception compared to the current situation. Currently, any construction is prohibited unless expressly approved. After the reform, any construction will be permitted unless there is a valid reason to oppose it. Municipal infrastructures are not suitable for the planned building. A professional consultant, inspector, engineer, or supervisory company does not have the required qualifications according to standards. The insurance company lacks the means to compensate victims in case of damage. Non-compliance with the terms of the agreed-upon District Building Plan. The planned construction will cause tangible and measurable damage to public infrastructure or to neighboring property. Those who are most likely to be harmed if damage to a person or property is caused due to building defects are the insurance company that insures the building and, of course, the customers themselves. Both the insurance company and the customers will have an interest in employing supervisors to oversee the construction process. These inspectors will be an important part of the building supervision system. Contractors will be required to build according to internationally recognized safety standards and to employ private testing institutes throughout the project, which will also be part of the supervision system. The website where the information about the construction project will be presented will be open to all: neighbors, the municipality, the insurance company, buyers’ consultants, or anyone else. Each stage and every deviation during construction will be reported on the website, along with the approvals and comments of the engineers and private supervisory bodies. Private inspectors who notice irregularities will be required to report them. Even after the reform, as today, there will be no direct supervision by the municipality of the construction itself. The municipality will inspect the building at the end of the construction, before the occupancy permit is given, and during the construction, will rely on the private consultants and the information published on the site. During construction, the municipality will supervise matters relating to the use of public infrastructure, such as connection to the sewage and water systems, construction that runs into public areas, and proper removal of building waste. The building department of the local authority will monitor the website and verify that the contractor is inputting and updating the details. A building code violation, failure to publish information as required, or failure to comply with the requirements of the law may lead to a halt to construction by the municipality or even a ban on occupancy. Failure to comply with procedures and laws will also constitute grounds to appeal to the court to stop construction. If the petition is accepted, the court may order the cessation of construction and in certain cases may prohibit occupancy. Almost all the issues that are currently flooding the city building committees and causing unexpected delays of months and years in the construction process will not be an obstacle in the absence of a City Building Plan. The developer will be free of the current necessity to negotiate the addition of construction areas, the number of rooms, the number of parking spaces and balconies, and dozens of other issues, but will be required to comply with the few legal requirements that are likely to remain. The degree of arbitrariness in the demands upon contractors and developers will be immeasurably smaller than today, but the degree of personal responsibility imposed on the developer to avoid failure will increase. Of course, when contractors are no longer compelled to circumvent arbitrary and restrictive planning and building laws, they will not demonstrate the degree of disdain they currently have today for the more important laws and the temptation to violate them will decrease. The easing of construction will expedite more than just the building of new structures. In the new era, there will be no legal impediment to adding floors to a building, carrying out work to strengthen the building, or converting residential apartments to offices, clinics or vacation apartments – subject to the DPA and engineering feasibility. There will be no need for prior permission or other involvement of the local government. The only limitation will be the agreement between the owners of the apartments in the building, which is joint property. In the absence of another contract, a simple majority of apartment owners in the building will suffice to allow different use of existing apartments or to add floors to the building in return for compensation from the contractor or in exchange for work to improve the structure. Such consent means a change in the rules for condominiums. Such a change will be registered in the Land Registry so that any purchaser of a future apartment in the building will know about it. The tenants’ ability to initiate changes and improvements in the building will allow them to respond to changing market demands and to earn directly, through compensation from the contractor, or indirectly, by increasing the value of their assets. We seek to prevent a situation in which frivolous objections by neighboring property owners impede construction projects or cause developers to incur unexpected expenses. However, we are aware that construction projects and changes in land use can cause tangible damage to neighboring property owners and that they should be protected from such damage or allowed to demand compensation. Therefore, Zehut’s construction reform includes a new, simple and clear definition of the right to object to the use of land. A nuisance stemming from public use: A nuisance deriving from construction work in a public area, from a change in the use of the area, or from the public’s use of the area or the buildings thereon. Examples of such inconveniences include the expansion of an existing road, the construction of a new road, or an increase in traffic congestion due to the development of the area. Such nuisances will not be grounds for demanding compensation or cessation of construction work from the state or the local authority. Anyone who purchases a plot or property that borders on public land will have to take into account that in the future there may be development work that will affect, for better or worse, the value of his property. The assumption is that such a possibility will be taken into account in the price that the buyer pays for the plot or property. A passive nuisance on the part of the neighbors: A nuisance that is created when building on a neighboring lot has an adverse effect on the enjoyment of natural resources; for example, when it hides the landscape or blocks sunlight. Passive nuisance will not be grounds for opposition to construction. In our view, natural resources do not become the property of those who enjoy them and therefore they have no right to demand that they continue to enjoy them. Whoever buys an asset or a plot will have to take into account the possibility that his neighbors will develop their property so that his enjoyment of the natural resources will be harmed. An active nuisance on the part of the neighbor: Unlike a passive nuisance, which prevents pleasure, an active nuisance is a nuisance that causes tangible damage to the neighbors and their property. Common active nuisances are noise, bad smells, smoke, and pollutant emissions. An active nuisance will constitute grounds for opposition to construction and will allow the court to stop construction, order the restoration of the situation to its previous state, or award compensation to the neighboring landowners. Guidelines, the function of which is to prevent an active or passive nuisance, may be part of the conditions and restrictions specified in the DPA. The right to object exists in addition to such guidelines and requires the owners of neighboring properties and lands wishing to object to clearly identify any tangible and quantifiable hazard. Following the proposed reforms, the functions of the local authority and of the state with regard to construction will change and be significantly reduced. The restrictions on construction will be determined at the neighborhood level, making redundant most of the functions of the local authority when it comes to planning construction. The most important responsibility that will remain in the hands of the local authority is the responsibility for municipal infrastructures, and it will have to adapt them to the changing needs of the residents and business owners in its territory. Often, large enterprises will require adjustment of municipal infrastructure to meet their needs. The local authority will have to make all necessary adjustments for the residents and businesses in its territory. In fact, adapting the infrastructure to the needs of municipal taxpayers is one of the few jobs that will remain for the local authorities after the reform. The cost of the necessary adjustments will be placed on the developer, since he will benefit from them. This can be done by collecting the payment directly or by means of a closed fund, to which developers will transfer money in accordance with the burden their projects add to the municipal infrastructure – funds that will be dedicated solely to financing future upgrading of the infrastructure when necessary. Of course, enterprising local authorities, who understand the benefits of attracting projects that will increase municipal tax receipts and enable the improvement of municipal infrastructure, will want to attract developers. The best incentive for a developer to invest in a project in one local authority, as opposed to another, will be the efficient and quick planning and execution of the required adjustments. In any case, funds collected from projects due to the need to adapt a particular infrastructure will only be permitted to be used for the planning and performance of the required adjustment and not for other purposes. The local authority will continue to bear responsibility for the planning, construction and maintenance of public buildings and infrastructure in its area: roads and sidewalks, street lighting, sewage and water lines, public gardening and the like. The building plans of the local authority will be published publicly on the Internet in keeping with the public’s right to know. As the local authority responsible for urban infrastructure, it will be required to prevent construction projects from damaging that infrastructure. The municipality will do so by examining the details published on the Internet before obtaining the building permit and by monitoring the connection to the infrastructure systems and the burden placed upon them. In the event that construction causes or is expected to cause damage to infrastructure, the local authority will petition the court. Since almost all the issues discussed today in building committees will no longer be determined by the local authority, these committees will not be needed. The municipal engineering department will deal almost exclusively with the planning of public infrastructure, the impact of new projects upon it, and supervision of the process of requesting a building permit. The State will continue to bear responsibility for the planning, construction and maintenance of infrastructure and public buildings outside the jurisdiction of the local authorities – intercity roads, nature reserves, airports, and the like. The taxation of real estate and construction will not be different from taxation in all other sectors of the economy, as detailed in the section “Changing the Taxation System” in this chapter. The improvement tax will be canceled because the municipality will not be able to influence construction plans after the cancellation of the City Building Plan, and there will be no land betterment tax because there will be a uniform and flat tax on all income, as detailed in the section “Changing the Taxation Method.” The State of Israel will become a duty-free state. As such, there will be no custom duties on the import of building materials, including cement. Fees will continue to be collected to provide public services, such as land registration. We will strive to transform these public service providers into closed systems that will be funded solely from fees, without transferring funds to the state and without receiving funding from the state budget. It will be possible in this way to ensure that the fees are used to cover actual expenses rather than becoming hidden taxation by alternative means. The expected simplification of the tax structure and the cancellation of the levies will reduce the need to hire lawyers and other experts on real estate laws or tax planning. Simple and low taxation and reducing the need to hire tax experts will also help lower real estate prices. Zehut’s construction reform is designed to address one of the main causes of Israel’s high housing prices – the regulatory barriers that make construction in Israel difficult and more expensive. The real estate reform is designed to address the second factor in the cost of housing – the high price of land. The high land prices stem from a low supply of land for construction, which fails to keep up with rising demand. The low supply is not due to a real shortage of land in Israel, but to an artificial shortage stemming from monopolistic control of the land by the Israel Lands Authority. Zehut believes that citizens, not the state, are the real owners of the land. We also believe that only trade in land on the free market, with no unnecessary restrictions, will make it possible to derive maximum benefit for sellers, purchasers, and the economy as a whole. The Zehut land reform will dismantle the monopoly of the Israel Lands Authority, transfer ownership of the land to citizens, and remove all the obstacles that prevent development and free trade. 93% of the land in Israel is controlled by the State through the Israel Lands Authority. The Authority allocates lands for various uses and decides which lands will be sold and which will be kept as building reserves for future needs, all at its sole discretion. This means that the ILA has an almost complete monopoly over the land in Israel. The land monopoly gives the ILA and the state power and influence. Creating an artificial shortage of land by selling it under restrictive conditions and at a slow pace allows the state to maintain this power. In the best case, the state uses its power to implement a centralized policy and to direct the economy according to its political worldview, rather than relying on the free market economy to meet the real needs of Israeli citizens. This causes damage to the economy as a whole. In the worst case, the power is used to grant favors to cronies and to strengthen improper ties between capital and power. The damage caused by the ILA monopoly is clear today, as much of the land lies fallow. This is because the Authority allocates land for politically expedient but unnecessary uses, such as agriculture, or because it is unwilling to sell it at all. At the same time, the insufficient supply of land for housing causes housing prices to rise. We believe that this monopoly must be dismantled and that the lands under its control must be returned to the citizens of Israel. The ability of the Israel Lands Authority to restrict the permitted use of land leads to its inefficient use, to the point that it is not used at all. In instances that these lands are used for positive and necessary purposes, the use is limited to promoting political goals and the interests of pressure groups. This practice harms the economy, slows growth, and ultimately increases the cost of living. The value of land restricted to unneeded use, such as agriculture, can rise sharply if reclassified to allow for more useful use, such as commerce. Control of the land classification system enables decisions that have enormous economic implications for landowners as well as for developers who wish to build. For this reason, the land classification mechanism constitutes a fertile ground for corruption and the granting of favors to cronies. Zehut’s land reform will completely abolish the private land classification. The existing distinctions between private land designated for commerce, industry, agriculture, housing, etc. will be canceled. Privately owned land will be classified as land for private use and landowners will be able to use the land in any way they wish. Nature reserve areas: streams, lakes, archaeological sites, etc., along with buildings or facilities for the benefit of nearby visitors, such as trails, camping areas and kiosks. Public infrastructure: such as roads, railroads, water and gas pipelines. Government areas: Lands used for government buildings, public buildings, research institutes, security establishments, military camps, training areas, and the like. All the lands that do not fit into one of these classifications will be removed from the hands of the Israel Lands Authority and transferred to the citizens. The method will enable trade in land on the free market, with no limitations. Implementation of the method will be free of state intervention. The system will grant every citizen an equal share of state land. Therefore, regardless of method, if profits from the sale or use of the land will be derived, these profits will be distributed equally among the citizens. The State shall not receive any part of these lands or the profits derived from the sale or use thereof. After eliminating the classification of private lands and after removing unused state lands from the Israel Lands Authority, the Authority will have lost most of its functions and can be closed. Some of the necessary functions, such as the removal of squatters from state land or the purchase of land for the state, will be transferred to appropriate departments at the Ministry of the Interior. Most of the state land was given to Israel’s early agricultural settlers by the State or the Jewish National Fund, free of charge, so that they would work the land. The lands were not transferred directly to the families of the agricultural settlers, but through intermediary bodies: party settlement movements and associations (moshavim and kibbutzim). The “gift” was not registered in the land registry as owned by the agricultural settlers or by the intermediaries, but remained in the hands of the State. Thus, the agricultural settlers received an intermediate status on the land – “right holders” – which allows them to use the land but does not give them any proprietary right over it. There is currently no argument over the fact that the agricultural settlers have rights to the lands for the simple reason that they have been holding them for two or three generations and there are no other direct personal claims. However, the State also has rights to these lands, rights that must be transferred to Israeli citizens in the framework of land reform. As long as the land rights are in dispute, it is impossible to develop this land and derive profits from it, a situation that affects both the residents of the agricultural communities and the economy as a whole. Therefore, it will be necessary to formulate, as soon as possible, an arrangement for the division of land between the farming communities and the state. In the present situation, where dozens of sectors and cronies have received presents from the state for decades, there is no way to calculate exactly who got what and turn the clock back. The agricultural settlers, through the kibbutzim and moshavim, received free land. At the same time, industrialists received free enterprises, cronies received exclusive production, marketing and import licenses, transport cooperatives received subsidies and monopolies, and so on. At this stage, it is impossible to decide fairly and impartially what part of the land should be transferred to the ownership of the agricultural communities. Therefore, we must make sure when formulating the arrangement that the damage caused by the delay in the transfer of land to citizens and its development does not exceed the benefit that we can obtain by continuing negotiations. It should be remembered that the land reform will lead to a significant reduction in land prices and the debate will become less pertinent. Once the ILA is dismantled and the state lands are transferred to private hands, it will be necessary to ensure that hostile elements will not be able to purchase land in the State of Israel. Zehut will pass a law that prevents the sale or lease of land in Israel to hostile elements. For this purpose, clear and comprehensive criteria will be defined and will be part of the formulation of the law. For example, hostile states and hostile organizations, citizens of enemy states and members of hostile organizations will all be considered hostile elements. Companies, organizations and corporations controlled by unfriendly elements will also be considered hostile. A list of enemy states will be compiled by the Ministry of Foreign Affairs and the Ministry of Defense. A list of hostile organizations will be compiled by the Ministry of the Interior and the Ministry of Defense, along with clear criteria for defining an organization as a hostile organization. Both lists will be submitted for Cabinet approval and will be updated from time to time, depending on the circumstances. Sales or leases to hostile parties will be deemed void by law. The sale or lease of land to hostile elements can result in a heavy and deterrent fine. The cancellation of construction prohibitions on private vacant land and free trade in the vast majority of public land will immediately release land that is sufficient to build millions of housing units. The cancellation of the ban on high-rise construction will enable the potential construction of millions of additional units without the need for additional land. Relative to the demand for new apartments, which stands at only tens of thousands of apartments per year, the potential supply of apartments will be almost infinite. The increase in the supply of available land for construction and the existence of an alternative in the form of high-rise construction will lead to a drop in the price of land – a significant component in the housing prices. In order to clarify the significance of canceling only one restriction, the restriction on high-rise building, one can observe the following data: In the Tel Aviv-Ramat Gan-Givatayim area there are approximately 22,000 buildings, most of which can add at least three floors. If we assume that three floors are about 10 apartments, the cancellation of the ban on high-rise construction means the addition of some 220,000 potential apartments. If added to the possibility of destroying some of the old buildings and building tall buildings in a process of evacuation-construction, the potential could rise to 300,000 or more new apartments. In other words, canceling only one restriction in one area can create potential for building hundreds of thousands of new apartments. The easing of regulation on developers following the cancellation of the City Building Plan and the simplification of the building approval process will make the construction more profitable, with the profit expected to be divided between developers and purchasers. The process of approving construction will be much faster and simpler, so developers will be able to profit from their investments in a shorter period of time. This will enable them to save interest payments on loans or to invest in additional projects, thus translating the time savings into additional profit. Limiting the power of the local authority to interfere with construction or impose arbitrary restrictions will reduce the developers’ risk of having to delay the execution of the work or incur costly changes. Today, construction developers take these risks into account and include them in the price as “security coefficients,” which means that risk reduction is likely to result in price reductions. In addition, the cancellation of taxes and special levies on real estate and the cancellation of protective tariffs on imported building materials should be taken into account, which will lead to a direct reduction in house prices. Judea and Samaria are wide areas of land, with a total area of about a quarter of the State of Israel. They are sparsely populated today relative to the very crowded coastal area. In addition, unlike the Galilee and the Negev, Judea and Samaria enjoy a convenient proximity to the commercial, employment and population centers of the country – the Dan Region and Jerusalem. These simple economic facts are secondary in importance to the fact that Judea and Samaria are the cradle of the Nation, the heart of the Land and the root source of Jewish identity in the Land of Israel. Here, in the economic section, we will focus on the economic aspects. Zehut believes that implementation of the economic policy detailed in this section and the political plan detailed in the political section will lead to the realization of the tremendous potential of the hills of Judea and Samaria in the areas of housing, infrastructure, traffic and commerce, a potential that has been wasted for fifty years. It is customary in Israel for the discussion on Judea and Samaria to be conducted mainly on the political level. As a result, the economic context has been neglected. The fact that the Israeli government never applied sovereignty to Judea and Samaria, did not regard these areas as an integral part of the state, and continued to act as a temporary occupier, has caused great economic damage to the region and to the state in general. This has led to excessive interference by Israeli governments, and also to their failure to take responsibility for the situation, expressed in uncertain policy. In this chapter we will address these economic failures and present the solutions to them. Historically, most of the lands in Judea and Samaria were held by the British Mandate government and later by the Jordanian monarchy. Another part was privately owned by Arabs and a considerable part belonged to Jews. The documents to that effect, however, have been destroyed. After the Six Day War, possession of public lands was transferred from the Jordanian government to the Israeli government. In the beginning, the Israeli government did very little to clarify the issue of land ownership in Judea and Samaria. This was due in part to the declared policy of non-settlement – because this and successive governments were waiting for negotiations in which Judea and Samaria would be returned to the Arab states, except for certain areas necessary for strategic security reasons. This approach, the military use of the land, led to expropriation policies for security needs, in the wake of which the Jordan Valley settlements were established at the initiative of the Labor governments. Even when the settlement dam was breached and settlements began to be established in Samaria, it was done as part of an expropriation of land for security needs, although this type of action was later blocked by the Elon Moreh case. Only then, after more than a decade, did Israel begin to map the lands of Judea and Samaria in order to declare them state land. Thus, about one million dunams of land were declared state land – land in which almost all Jewish settlements were gradually established by direct government decisions – with the land allocated by lease. Since the future of the entire region has been shrouded in uncertainty since the victory of the Six Day War to this day, Israeli governments have imposed severe restrictions by directly interfering in land and real estate transactions in Judea and Samaria, far beyond what they have imposed within the Green Line. As a result, the purchase of land and structures in Judea and Samaria has become a process that ranges from difficult to impossible from an administrative point of view. It requires the approval of the Minister of Defense for the actual execution of the transactions – an almost incomprehensible reality for those who live in the territory under the sovereignty of the State of Israel. Following the establishment of the Palestinian Authority, a new situation was created: Some 40% of the area of Judea and Samaria, which is the majority of the area desired for settlement, has become completely inaccessible to commercial trade in land and real estate under the laws of the Palestinian Authority. The punishment imposed by the Palestinian Authority on anyone who sells property or land to Jews is death – a punishment that has been executed many times and includes torture or unlimited imprisonment. Under such conditions, in which there is no clear state ownership of land and there is no possibility of private trade under stable and reasonable conditions, all economic activity surrounding real estate and land is in deep freeze. Near the end of the Jordanian rule in Judea and Samaria, King Hussein tried to stabilize his weak rule in the region by means of wholesale distribution of state land to Mukhtars and those loyal to his rule. The Government of Israel has so far treated this distribution as valid and land that was registered in this manner as private land. As part of the process of enactment of the Authorization Law, Israel may even grant this land distribution legal validity. Zehut objects in principle to the recognition of this distribution, based on its understanding of the Jordanian occupation regime that preceded the Six-Day War as a foreign and illegitimate government, with no legal significance to its decisions regarding the distribution of the land. In the view of Zehut, the legitimate criterion for private ownership is the proven and continuous use of the land, and not this illegitimate distribution. If the only proof of ownership of any land that is not cultivated or inhabited is based on this Jordanian distribution, the land will be considered Israel State Land. The application of sovereignty in Judea and Samaria and the implementation of Zehut’s plan for state-owned land will open the land market in Judea and Samaria to Jews. Zehut has no doubt that when the lands in Judea and Samaria become available for private purchase under simple conditions, most of them will be purchased by Jews, because of the national importance of the lands of Judea and Samaria, and also because these lands are attractive to the Israeli populace that is crowded into the central plains. It is not the role of the state to establish settlements and to plan them, as has been the custom in Israel in recent decades (with regard to Jews only — it should be noted). In the new reality, Jews who wish to establish a community will have to buy land from its owners (Jewish or Arab) and establish a community with their own money and without government involvement. The State of Israel will not “build in the territories,” as happens today, rather, the People of Israel will inherit its land. At the center of the discussion on Judea and Samaria is a “continuous” population census, in which all the parties concerned are busy counting the Jews living beyond the Green Line, each for its own purpose. This counting misses the fact that the areas of Judea and Samaria are dropping off the country’s strategic planning map, both in terms of establishing settlements and in terms of of infrastructure. Since the Oslo Accords, not a single settlement has been established, in contrast to the 150 that were established in the previous decade. It is true that since then new neighborhoods have been established, which are actually settlements in every respect. But this is almost always done within the framework of the original outline plan of the settlement, since the construction of new outposts has been almost completely halted, with isolated exceptions, as when settlements have been authorized as a response to terrorist attacks. Although the number of Jews in Judea and Samaria has indeed quadrupled since the Oslo Accords, the settlement map itself has hardly changed. 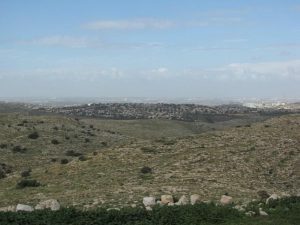 The application of sovereignty and the opening of the entire area of Judea and Samaria to potential settlement will lead to a rapid and clear change in this area, and will enable natural development of the region, whose economic and demographic growth has been artificially halted over the past 20 years. Despite what was mentioned above, regarding the general policy of reducing intervention in the establishment of settlements, the strategic neglect of the Judea and Samaria region in terms of regional planning requires balanced intervention, which will lead to the allocation of new plans for the growth of cities and regional centers. In the 1980s, parties that worked in cooperation with the Likud governments had great plans for Judea and Samaria, some of which were actually implemented. The Trans-Samaria Highway to Ariel, Route 1 to Jericho, and most of all Route 443 from Modiin to Jerusalem are examples of national-scale infrastructure that pass through Judea and Samaria. However, the number of critical plans that were shelved due to considerations of “over-enthusiasm-in-relation-to-areas-whose-future-is-vague” is far greater than the number of plans implemented. The route of the express train from Tel Aviv to Jerusalem was planned to pass close to Route 443, without needing tens of kilometers of tunnels to be dug for the train. But this plan was shelved because the route passed beyond the Green Line. We can’t undo what has been done, and the public has wasted billions on nearly 30 unnecessary kilometers of tunnels. Despite this, Road 45, which was planned in the 1980s to become the main road between Tel Aviv and Jerusalem, is still awaiting its construction. This road will replace the old Route 443, just as Highway 6 replaced Route 444. Its construction actually began, but it was shelved for too long, and the short section of the paved road was recently connected to Highway 443. The future of this road still remains to be seen. It constitutes the only reasonable strategic solution for reducing congestion on the roads between the Dan region and Jerusalem. One of the strategic economic damages of the Wye Accords from the first Netanyahu government was its handing over a strategic section in northern Samaria designated for construction of the Trans-Menashe Highway. This highway was supposed to connect Hadera to Beit Shean by a straight lateral road, in order to increase the accessibility of the Beit Shean Valley to the center of the country, and of course to create an additional transportation and commercial artery for the State of Israel. The benefit of shortening travel time from areas in the periphery to the center should not be underestimated, and this road could have made a significant contribution. Zehut sees this road as a national strategic necessity and will make it a high priority. Since the days of Abraham, Route 60 has been one of the main roads in the Land of Israel (“the Mountain Way”). Relative to its centrality, it does not meet the elementary requirements of infrastructure. Most of it is single-lane, often with dangerous twists. Because of the Oslo Accords, it was blocked to traffic in the north. This has led to a harmful separation between Samaria and the Jezreel Valley and the Galilee, greatly lengthening travel times and preventing vital economic connections. The time has come to expand Route 60 and to make it a central road that serves a very large population, both Jewish and Arab. The Trans-Samaria Highway from Tel Aviv to the Jordan is the largest and highest quality road in Judea and Samaria. Not long ago, it was paved as a two-lane road to the city of Ariel itself, after many years when it only reached the outskirts of the city. The time has come to expand it to the Tapuach junction – the central junction in Samaria – and turn it into an interchange. The poor road quality in Judea and Samaria causes hundreds of thousands of residents to prefer making the trip from Samaria to Jerusalem on Route 6, which extends the travel many dozens of kilometers, yet saves precious time. This places heavy loads on the already-busy Route 6. The necessary improvement of the road infrastructure on the Mountain Road will also ease the burden on the roads in the center of the country, and will be the key to the economic development of the region. For many years, maps of future planning for the railway have shown a plan for building the Tel Aviv-Ariel line. As long as the railway network in Israel is in government hands, this line is also a clear priority. The Samaria area is home to a young population, a large part of which has no private vehicles. The development of the university in Ariel increases the need even further. Railways constructed to provide efficient and rapid transportation from Samaria to the coast will be more utilized than the other projects currently being built by Israel Railways, especially so given the expected steep increase in the rate of population growth in Samaria, with the cessation of the existing artificial restrictions. In the late 1970s, the heads of Gush Emunim submitted to the Israeli government a master plan for regional development in Judea and Samaria, which they sought to promote. Their plan included the growth of the Jewish population of Judea and Samaria to one million inhabitants by the year 2000, almost 20 years ago. Nothing in that plan was imaginary, except for the willingness of the Israeli government to adopt it. Judea and Samaria during the Second Temple period, when there were no high-rise buildings, held some 4,000,000 people (Jews, Samaritans and Edomeans). If it was possible then, it is probably a very reasonable number today. Even more than most of the other steps that can be taken, the opening of the housing market in Judea and Samaria will lead to a very significant decline in housing prices in Israel. 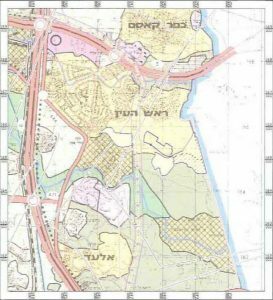 You can see that the whole area east of Rosh HaAyin is painted white, meaning that nothing is planned in it even though it is empty. This picture shows a view of Rosh Ha’ayin from the east, which illustrates the folly of being unable to cross the Green Line in construction plans. The erasure of the Green Line by applying sovereignty in Judea and Samaria will release the land reserves of the Dan region and will balance the housing prices there. The tax rate prevailing in Liechtenstein. Doing Business 2017 — Regional Profile 2017 — OECD High Income, A World Bank Group Flagship Report. Local produce that has an advantage over imported products will be purchased by domestic consumers anyway and does not need protections. Mishnah Sanhedrin, Chapter 2, Mishnah 4. Countries have established transport infrastructure since early antiquity. For example, the following words on behalf of Transportation Minister Israel Katz from 15.12.2016: “Katz noted that within the framework of Ashdod winning the “Model City for Sustainable Transportation” project, more than a quarter billion shekels will be invested in it for the development of green transportation and encouraging the transition from private vehicles to public vehicles”. Such as Uber and other companies in this field. 6.3 miles per thousand residents, as opposed to 2.0 in Los Angeles. Director General of the Transportation Ministry: “We will never catch up the growth rate of vehicles – the public should demand public transportation” – http://www.calcalist.co.il/local/articles/0,7340,L-3697938,00.html . Highway 1 – from Mevaseret Tziyon to Jerusalem, Highway 2 – from Netanya to Galilot, Highway 4 – from Raanana to Rishon LeTziyon, Highway 4 – from the Eshkolot interchange to Ashdod, Highway 5 – from the Kesem interchange to Galilot, Highway 20 – from the JNF interchange to to Holon, Highway 22 – from Haifa to Kiryat Bialik, Highway 38 – from Mesilat Tziyon to Beit Shemesh, Highway 40 – from the Ramlod interchange to Kfar Saba, Highway 45 – from the Givat Ze’ev interchange to Jerusalem, Highway 57 – from Kfar Yona to Netanya, Route 60 – from Afula to the Achsel interchange, Highway 60 (tunnels) – from Jerusalem to Neve Daniel, Highway 65 – from the Iron interchange to Umm al-Fahm, Highway 66 – from Megiddo to Mishmar HaEmek, Highway 70 – from Yokneam to the Yagur interchange, Highway 85 – from Carmiel to Acre, Highway 444 – from Rosh HaAyin to Shoham. The level of air pollution for 10PM particles and 2.5PM particles according to the World Health Organization: New York 10PM=16, 2.5PM=9, Los Angeles 10PM=20, 2.5PM=11, Chicago 10PM=22, 2.5PM=12, Kansas City 10PM=16, 2.5PM=9, Sderot 10PM=51, PM2.5=22, Eilat 10PM=53, 2.5PM=23, Haifa 10PM=35, PM2.5=18, Petah Tikvah 10PM=57, 2.5PM=24, Tel Aviv 10PM=48, 2.5PM=20, Amman 10PM=68, 2.5PM=36, Cairo 10PM=179, 2.5PM=76. The American standard states that the value should not exceed 50 for 10PM and Europeans even insist on a maximum value of 40. In Israel, so as not to create a crisis with the Arabs, the value was raised to 75. A maximum value of 25 is acceptable all over the world, except the Arab world, as the maximum value for 2.5PM. Faulty catalytic converters, oil plugs etc. The TV fee was eliminated with the closing of the Broadcasting Authority Act, but the radio fee collected as part of the annual license fee was not canceled by that law. Such as the obligation to complete the test within 30 days or the obligation to keep a trash basket in the car. Sovereignty is part of a policy of identity in the political-security specified in this platform. The original division into quarters will in fact coincide with the division into communities that appears in the «Community Model» chapter. Another division may be carried out later, subject to the consent of a special majority of property owners in a continuous geographical area. Water, sewage and the like. Such as electricity, construction, parking, fire and the like. Similar to the manner in which changes in the City Building Plan and new projects are published under the Building Planning Law. Further details on the adjustment of municipal infrastructure to construction projects will be included later in this chapter. Details of the types of damage that justify resistance to construction will be included later in this chapter. A procedure that exists today — for example, the requirement to hire a laboratory that checks and confirms the quality of the concrete. This means deviating from the details reported by law. The contractor may make other changes provided they do not deviate from the standard. The majority will be an ordinary majority or a privileged majority of up to 75% of apartment owners. A few basic limitations on public peace will continue to be determined at the state level. The clearest example is the list of permitted building standards. The tariffs will be gradually abolished, as detailed in the section “Industry and Trade in Israel” in this chapter. Subject to the DPA, where it applies, and to any other contract. It will be possible to leave a small percentage of unused state land to the state for the implementation of planned projects that meet one of these definitions. If the planned projects are not completed within a specified period of time, these lands will also be transferred to the citizens. This does not rule out public sale for the highest price by the state, because the state can not exercise judgment and interfere in such a sale. Of course, this is only one of many possibilities. Except for the flat tax that applies to all types of income and therefore will also apply to income from the sale of land. An invasion of state land may still be a problem, especially invasion of squatters on training grounds, although its dimensions will greatly decrease after the state relinquishes the unused land. The reference is to those vacant lands that the state now holds; not to land that has been used. Including a severe blow to the Arab residents, whose situation today could have been much better. Historically, it is important to note that ownership of “state lands” in Israel was something that Britain “inherited” from the Islamic caliphate, in its various incarnations, which “inherited” it from the Roman Empire, which “inherited” it from the Jewish Hasmonean state. It is our own country that has returned to us. For example, the Nablus Tabu (land registry) archive was torched during the Six-Day War in order to prevent Jewish claims of ownership over significant parts of the area. It was then determined that private land in Judea and Samaria should not be expropriated for the purpose of establishing civilian communities on the grounds of a security need. All but two of the world’s countries did not recognize the Jordanian occupation of what, according to the partition plan, was meant to be a Palestinian state. Rechalim, Shvut Rachel, Bruchin, and others. Zehut views this method as despicable, because it places the state in the position of a neutral arbitrator between Jews and Arabs, and only when the Arabs attack Jews in a particularly painful manner does the state consider itself obligated to compensate the Jews by approving construction. As detailed in the political plan.